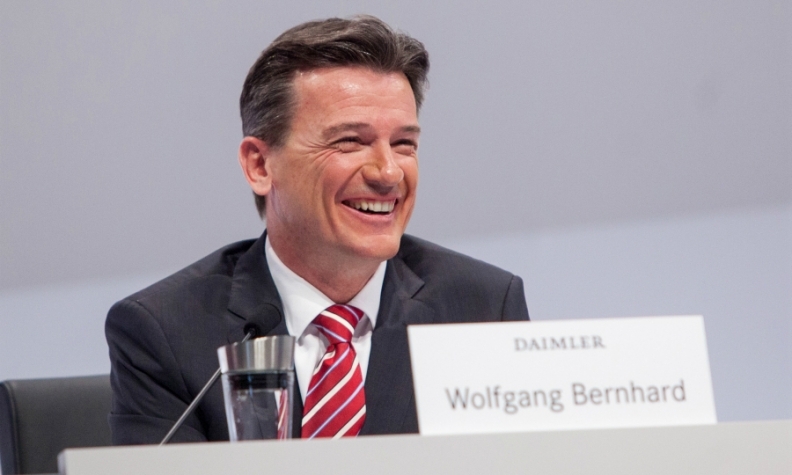 Bernhard's skills as a turnaround manager landed him top jobs at Daimler and VW. FRANKFURT -- Daimler has confirmed that trucks chief Wolfgang Bernhard, a top manager once seen as a successor to CEO Dieter Zetsche, will leave the company "at his own request and for personal reasons." Bernhard's contract had been due to expire in February 2018. The automaker gave no further details on the grounds for his departure. "We regret this resolution, but we have a number of outstanding managers to succeed. We thank Wolfgang Bernhard for his committed work and respect his personal decision," Manfred Bischoff, chairman of the supervisory board, said in a statement. Daimler said Bernhard, 56, will leave his role with immediate effect and Zetsche will take on his duties until a successor is appointed. Bernhard's skills as a turnaround manager landed him top divisional jobs such as head of Mercedes-Benz Cars, Chrysler and as CEO of the Volkswagen passenger car business in a wide ranging career in the auto industry. But last year Daimler extended Zetsche's contract by three years, a move that effectively ruled out Bernhard as a potential successor. Bernhard will be close to 60 in 2019 when Daimler is due to choose its next chief executive. Daimler's 20-member supervisory board met on Friday to discuss Bernhard and a possible contract extension, a source had told Reuters earlier, but Bernhard instead asked to leave. Bernhard began working at Daimler in 1994 and moved through the ranks to become head of Mercedes-Benz Vans, board member for production for Mercedes-Benz Cars and eventually head of trucks. Bernhard also did a stint as chief operating officer at Chrysler, a U.S. brand Daimler has since sold off, and that experience might make him a contender to succeed Fiat Chrysler boss Sergio Marchionne when he retires in 2019. "If he is leaving Daimler he must have opportunities elsewhere to become chief executive somewhere else and at Fiat Chrysler a job is freeing up soon," said MainFirst analyst Daniel Schwarz. "Fiat needs a strong personality at the top so it could be a good match." In February last year, Daimler promoted Ola Kaellenius, a 46-year-old Swede, to become board member for r&d, a move that company insiders say made him a natural heir to Zetsche. Daimler said on Friday it had extended Kaellenius' contract until the end of 2022.